It happens to all of us sooner or later, and to some of us more than others. At some point every woman starts to think about how best to manage her facial hair. And we’re not talking only about women here – how about that uni-brow phenomenon some our menfolk have going? 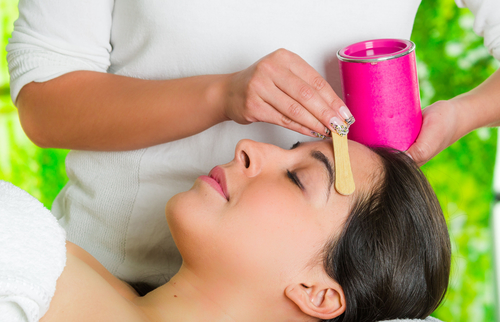 Whether it’s getting a perfectly shaped eyebrow or removing some upper lip shadows, facial waxing is the way to go. Having a cosmetologist take care of the process is truly a blessing. Waxing lends itself to precise application, and those oddly shaped spots on faces can be tricky if you’re trying to do too many things at once. Plus, a licensed pro is not only more likely to get it right, he or she is also more likely to make your skin better in the process. That’s right – properly done, waxing can be good for your skin. It removes dead skin cells along with unwanted hair, and the after care advice you’ll get from your cosmetologist will help your skin look and feel its best. Plus you’ll stay smooth and hair-free for weeks at a time. In addition to the immediate results, regular waxing has other benefits too. Because you’re removing each individual hair completely along with its root, over time the rate at which it grows back will slow down. In fact, in many cases, it will stop growing all together. In the meantime, each time it does regrow, it will be softer and less noticeable than it was prior to waxing. A smooth surface will let any makeup that you wear sit more naturally, and if you choose to go au naturel, those healthy new skin cells uncovered by waxing will add to your own beautiful glow. The team of professional cosmetologists here at Full Spectrum Hair Salon is committed to helping men and women alike look and feel their best with a full range of hairstyling and skin care services and treatments. You can find us at 305 E Farm to Market Rd 544, #911 in Murphy, or give us a call at 972.509.1565. Prefer to instantly schedule your own appointment? Use our mobile app – you can download it for free from iTunes, Google Play, or Amazon.